The largest, most comprehensive collection of Israeli folksongs in print! Culled from 10 acclaimed music books and dozens of audio recordings, this collection is a broad overview of the beloved, classic folksongs from pre-State to present times. Includesmelody line, chords, full Hebrew texts, transliterations, and annotations for more than 165 songs. This one-of-a-kind collection features newly-composed rounds by prominent Jewish composers as well as traditional folk pieces. Great for school, temple/church and volunteer choirs. Includes Hanukkah/Hannukah/Chanukah, Psalms, Biblical and Ethical Teachings and other sections. Featuring new works by such esteemed composers as Samuel Adler, Michael Isaacson, Bonia Shur, Linda Hirschhorn, Michael Horvit, Gershon Kingsley and many others. 8-1/2 inch. x 5-1/2 inch. Bring Jewish culture and history into your home or classroom with this comprehensive collection of children's music! Over 300 pages, this book features more than 200 songs that highlight stories from the Hebrew Bible (like the Maccabees, Esther and Jonah), encourages civic values through ethical teachings, and teaches the traditions of the Jewish holidays. Discover even more delightful songs with this second volume of the popular children's collection. This extensive folio contains nearly 200 new and traditional songs about biblical character and events, holidays, and Jewish traditions and ethics. Appropriate for schools, camps, religious services and children's choirs. Includes extensive indices by subject, composer, title and curriculum. 286 pages. Easy Arrangements by Simon Cohen. 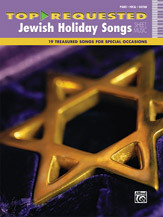 Includes songs for Passover; Holocaust Day; Memorial Day; Independence Day; Lag B'Omer; Jerusalem Day. This extensive collection of Yiddish Texts and Music with parallel transliterations, translations, historical insights includes lead sheets with guitar chords for over 100 Yiddish songs. Songs of Childhood, Love, Work and Home, the Street, Theater, the Holocoaust, the former Soviet Union, Hassidic and National Songs as well as Humorous songs and songs for celebrations and parties. An invaluable treasure trove for Klezmer groups and singers and soloists. Includes a translation guide. This huge collection features piano/vocal arrangements of over 100 songs of Israel; songs in Yiddish, Ladino and English; Sabbath songs; Hanukah songs; festival songs; and selections for the Passover Seder. Includes: Adir Hu � Ballad of the Four Sons � Donna, Donna � Erev Ba � Hanukah Candle Blessings � Hava Nagila � I Have a Little Dreydl � Jerusalem of Gold � Nigun � Papirosen � Siman Tov � many more. Also includes a key to transliteration. 17 traditional songs to sing at the Passover Seder: Adir Hu  Avadim Hayinu  Ballad of the Four Sons  Chad Gadya  Dayenu  Eliyahu Hanavi  Go Down Moses  Hal'luya  Ma Nishtana  Quen Su Piese  A Snow White Kid  more. 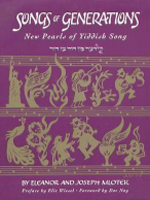 Includes a section listing the order of the Seder Service and when to sing each song, and a key to transliteration.